Today I will discuss about Best Term Insurance Plans for 2018.In India generally life insurance is referred to as traditional life insurance only.But there is other type of life insurance as well. Term Life Insurance – as the name itself suggests that this is an insurance which covers the risk of one’s life for a specified term or period on payment of lump sum or regular premium.If during the risk coverage period the insured person dies ,the predetermined sum assured is paid to the nominee of the insured.Further, during the policy term if no unprecedented incident occurs (no death), no maturity value will be paid to the policy holder.Since, term life insurance provides purely life risk coverage at a very nominal premium as compared to traditional life insurance, it is gaining momentum day by day.Term insurance emphasizes solely on risk coverage and therefore its inherent nature is insurance and not an investment. Why to choose Term Insurance? It is noteworthy to state that Term Life Insurance is a very low cost product,covers a huge life risk at a very low premium and provides insurance even up to 100 years of age.One can buy it online very conveniently at home.Online Term policy is very cheaper and no undue influence by the offline agents due to non engagement of middleman in online policy. Term i.e. period of coverage. Standard risk coverage ratio and beneficiaries:Generally , Term insurance should be done for at least covering 10 to 12 times of one’s annual income and is beneficial for sole bread earning member of the family who do have many other financial liabilities as well. How to choose Best Term Insurance plans for 2018? Currently, there are 24 numbers of insurance companies operating in India. All of them do sell Term Insurances in different variety of options covering all of our needs.Now, the question is are all of them good or best suited for everyone.The answer is probably no.Now, take a look at the factors that you should consider before buying a term life insurance. While buying a term life insurance policy you should consider the following factors . 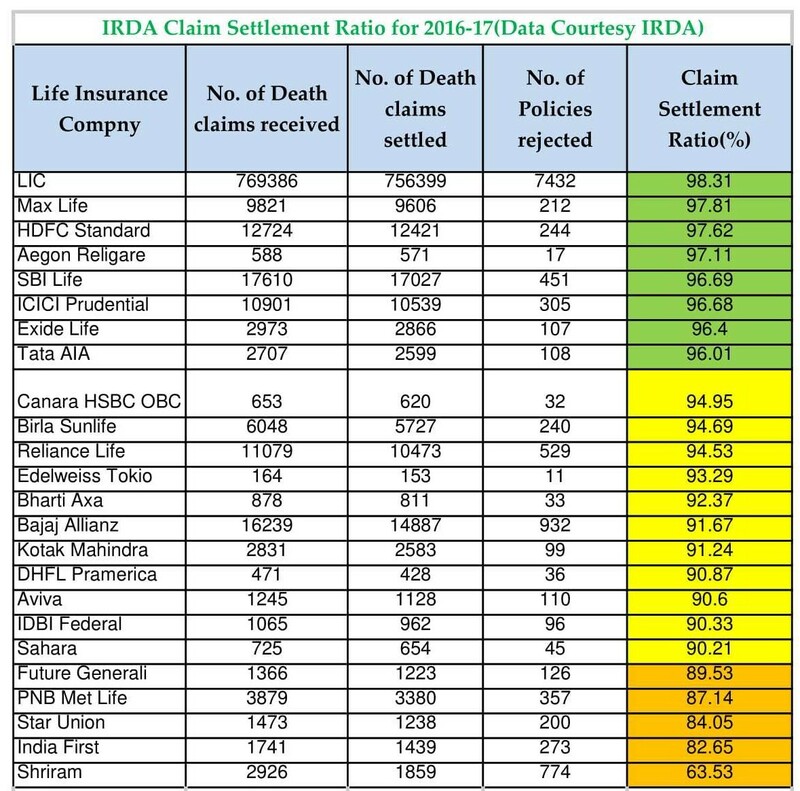 We can observe from the above table that out of total 24 Companies only 8 Companies did achieve a claim settlement ratio over 95%. From the above data chart we can observe and analyze that only the following 5 Companies have crossed the ₹ 5 Lakh threshold. It’s very noteworthy to watch from the above chart that LIC, Maxlife and HDFC Standard which were on the best top 3 list as per the above claim settlement ratio but stands no where as per the average claim settlement amount.Therefore, I can say that only the “Claim settlement ratio” must not be the deciding factor. Now, I will move forward this discussion towards the second deciding factor i.e. Premium Cost.Moreover,I have selected 5 companies out of the above two results altogether. Let’s take an example. A 30 years healthy man ,smoker & alcoholic , Policy term 30 years,Sum assured ₹ 1 Cr.This policy is a plain vanilla one without any additional plan feature. Finally, you can see that LIC lacks in this segment as well. HDFC Standard leads the competition.Thereafter comes Aegon Religare,Max Life,ICICI Prudential and lastly LIC. I am not discussing the features of the above mentioned 5 insurance policies categorically.Since, I have considered the premium only for plain vanilla policy feature which has no other option. In conclusion, I reiterate that I personally do neither directly nor indirectly promote any Company or their products.The above discussion is based on my observations solely from actual data.Buyers may consult with any financial expert before buying an insurance products.I hope I have done enough justice on Best Term Insurance Plans for 2018. Disclaimer: Finally,Buyers may think before buying any insurance product. Buyers may not held ArthikDisha responsible for any of their product buying. You can comment below regarding any of your queries. Do share if you like this blog post.